My family and I were very lucky when certain circumstances led us to Dr. Stewart 10 years ago. 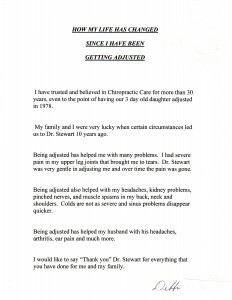 Being adjusted has helped me with many problems. I had severe pain in my upper leg joints that brought me to tears. Dr. Stewart was very gentle in adjusting me and over time the pain was gone. Being adjusted also helped with my headaches, kidney problems, pinched nerves, and muscle spasms in my back, neck and shoulders. Colds are not as severe and sinus problems disappear quicker. Being adjusted has helped my husband with his headaches, arthritis, ear pain and much more. I would like to say “Thank you” Dr. Stewart for everything that you have done for me and my family.